Pot to PotWhat We Do. Spencer Gulf is a unique marine environment in South Australia. It has the most extensive seagrass meadows in South Australia. The mangrove Avicennia marina forms large forests around the coast. Both of these habitats provide vital nursery areas for a large number of fish and crustacean species such as the Blue Swimmer Crab in the gulf. The Gulf St Vincent has a variety of habitats which include saltmarshes, mangroves, tidal flats, dense seagrass meadows, sandy seafloors, sand/shell grit beaches, tidal creeks and river deltas. The coastal wetlands of Gulf St Vincent provide nursery habitats for King George Whiting, Southern Garfish, Mullet, King Prawn and Blue Swimmer Crab. Exposed tidal flats provide also important food and resting places for thousands of migratory shorebirds during summer. Species within the region are influenced by the distinctive clockwise circulation of currents within Gulf St Vincent. Blue Swimmer Crabs (Portunus armatus) are distributed throughout the coastal waters of the tropical regions of the western Indian Ocean and the Eastern Pacific and have adapted to a life in warmer waters. In the relatively colder, temperate parts of Australia, their life cycle has evolved to increase growth and reproduction during the warmer part of the year when water temperatures are elevated to those similar to the tropical regions. As a result, crab activity reduces during the colder winter months. Blue Swimmer Crabs are found throughout South Australian waters but the majority of the stock inhabits the warmer shallow waters of Gulf St Vincent and Spencer Gulf. Blue Swimmer Crabs are generally distinguished by the fact that their last pair of legs are modified as swimming paddles. They are active swimmers but when inactive, they bury themselves in the sediment leaving only their eyes, antennae and gill chamber opening exposed. Males are blue and have larger claws than females, which are green-brown in colour. The species occurs in a wide range of algal and seagrass habitats and on both sandy and muddy substrata, from the intertidal zone to at least fifty metres of depth. 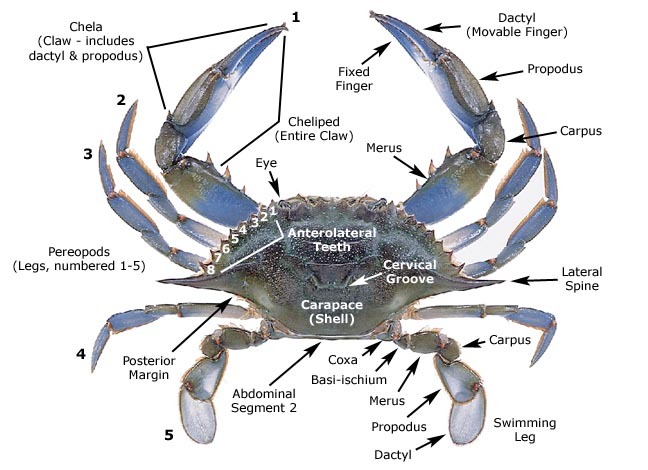 In coastal waters, smaller crabs are found in shallow waters, while adults are found in comparatively deeper waters. Juvenile crabs occur in mangrove creeks and mud flats for eight to 12 months by which time they attain a size of 80 to 100 mm carapace width. Within South Australia, there is a distinct seasonal pattern of adult crab movements into shallow inshore waters during the warmer months of September to April and to deeper offshore waters during the colder months of May to August. Male and female Blue Swimmer Crabs generally reach sexual maturity at a size of 70 to 90 mm in carapace width, when they are approximately one year old. The spawning season lasts for three to four months over the summer/autumn period. The duration of the growing season varies among individuals because those settling in early summer have a longer growing season than those settling in mid-to-late summer. In South Australian waters, crabs close to the minimum legal-size (110 mm) are approximately 14 to 18 months old, sexually mature, with females having produced at least two batches of eggs within one season. Meet the FV Silver Spectre! She's a 24 metre, purpose-built, aluminium structured one hull (mono) boat. She even has a kitchen and comfy accommodation that sleeps eight! 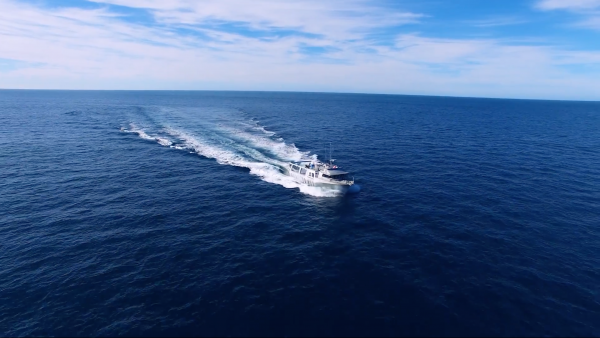 The Silver Spectre is powered by two Yanmah diesel engines to give her the propulsion to glide through the Gulfs and she is sustained by two electrical generators. The little generator is used to provide lighting and refrigeration on board and the big generator is used to start up the Silver Spectre and maintain the operation of the ice machines on board. The boat has four Optimar ice machines imported from the best ice experts in the world – Iceland! The flow ice machine pumps ice around the boat using compressed air (which has a function to adjust ice consistency) to make sure there is a super cooling effect on board. Flow ice is superior to flaked ice due to the super cooling effect it produces which, is responsible for Two Gulfs Crab superior product quality. Dennis developed the entire hydraulic deck system on the Silver Spectre for handling product to ensure maximum efficiency. Not manually handling pots and utilising hydraulics means bigger pots are much easier to use and it keeps staff safe. How we Catch our Blue Swimmer Crabs. Once our Blue Swimmer Crabs are caught, they are hauled on board using Dennis͛ specially designed hydraulic system. A chute ensures females with eggs and undersized catch go back straight over the side of the FV Silver Spectre and back into the water quickly. Our crabs are then fed into a refrigerated holding tank system where they are humanely put to sleep very quickly through the slow reduction in temperature. Once the crabs are ready, they are moved onto a conveyor belt where they are sorted by hand for size and quality. Quality indicators we look for include shell hardness, no shell damage or lost claws and a nice, heavy weight. Each sorted batch of crabs are then either stored ͞green͟ (uncooked) or cooked on board the Silver Spectre in nothing but pure, unpolluted sea water. At Two Gulfs Crab we pack our green and cooked product into standard, iced fish bins and these then go straight into the cold storage facility on board. We ensure our product is cooled very quickly to maintain premium product quality and excellent shelf-life. 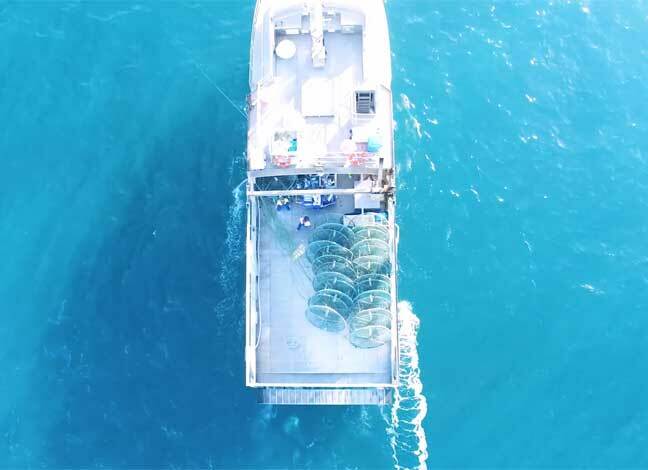 We unload our catch twice a week into refrigerated trucks where our product is then distributed to Adelaide, regional South Australia (Yorkes Peninsula), Sydney and Melbourne. © 2018. All Rights Reserved 2GC.